I'll admit it: I am confused about genetics and heritability. Not about the results of the various twin studies - Scott summarises them as "~50% of the variation is heritable and ~50% is due to non-shared environment", which seems generally correct. If race were a factor in twin studies, I think it would show up only in shared environment, since it differs between families but never within families (and is not differently different in MZ vs. DZ twins). That means it would not show in "heredity", unless we're talking about interracial couples with two children, each of whom by coincidence got a very different number of genes from the parents' two races - I think this is rare enough not to matter in real life studies. Your point stands about the general role of these kinds of things, I just don't think it's counted that way in the twin studies we actually have. You're right about beauty etc, though. Genetic studies are most informative about interventions to change individuals' standings relative to other individuals, not about interventions to completely change the nature of the playing field. But I think it would, unless I'm misunderstanding. If the world is (uniformly) biased against blacks, then the genes for "blackness" would be correlated with reduced outcomes, with no environmental effects since all environments are equally prejudiced. For the effect to show up in environment, you'd have to have varying environments with different levels of prejudice; if the differences are pronounced enough, then you'd start seeing racial variations on the environmental side. In a world where it was indeed perfectly even, lets say a world with a highly regimented system of prejudice where everyone's skin tone is carefully measured and restrictions were then applied across the country. But if prejudice isn't perfectly even or measuring the same things then you'd expect it to vary. If one twin grows up in a town where most of the residents still oppose miscegenation while the other ends up in a town with far less prejudice then the difference is going to show up as environmental. Or if they have the same accent and same skin tone but one grows up in a town where people are more prejudiced about cultural markers like accent and dress while the other grows up in a town where they care more about biological markers the difference would show up as environmental. 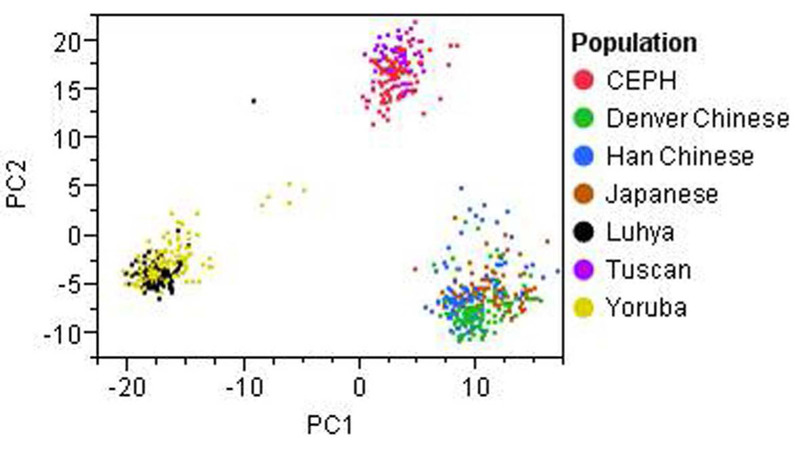 Also it's common to run PCA when dealing with samples from different ethnic origins to make it easy to spot when you've simply flagged up a variant linked to one group. If your flagged variant overlaps almost totally with only one group then it can be a sign that your analysis has been confounded though overlapping a little more with one group than with others is to be expected. Yep. And depending on both the strength of the prejudice and the degree of variation, it would show up more on the "nature" or "environment" side. Which is why I'm putting those words in scare quotes. Excellent point, which deserves some elaboration. Suppose that very high doses of vitamin K dramatically increase height, but that almost nobody is experimenting with such doses. Then a heritability study will find that environment contributes little to the variation in height - but that's usually not what we want to know. What we want to know is more likely something like, what steps can I take to have tall children? If a gene makes you more attractive and because of this attractiveness others respond better to you and this makes you better able, with the help of others, to solve problems then this gene really has made you more intelligent. For that matter, if that attractiveness makes teachers more interested to spend time on teaching you, then attractiveness can also make you better-educated. I think what we're trying to get to with the idea of intelligence is some kind of independent mental property that doesn't have to do with those sorts of things. What I hear you saying is that this independence is pretty much a myth! What I hear you saying is that this independence is pretty much a myth! Robin argues the second effect - falsely perceive - is strong. Related: this lengthy post by Cosma Shalizi about heritability and IQ. (One of several he wrote on similar themes at around the same time.) Shalizi is incredibly smart but some here may defensibly suspect that his opinions on these matters are derived from his politics as well as from mathematical analysis and empirical evidence. Obviously racial effects go under this category as well. I think you meant "obviously racial effects could go under this category as well." It's not the case that we live in a society where only members of particular races are allowed to work at all, and that this forces a correlation. It covers anything visible. So a high heritability is compatible with genetics being a cause of competence, and/or prejudice against visible genetic characteristics being important ("Our results indicate that we either live in a meritocracy or a hive of prejudice!"). There's a natural experiment that can distinguish between the "colorism" theory and the "heritability" theory. Can you think of what it could be? But is it possible that IQ itself is in part a positional good? The easiest way we can look at this sort of thing is comparing individual returns to IQ on income and national returns to IQ on income. If IQ is used mostly for absolute improvements, the latter will be larger than the former; if it is used mostly for predatory purposes, the former will be larger than the latter. PS: But I may have overemphasised IQ. The main point is that "heredity" vs "environment" are not categories which say what we think they do. I think you meant "obviously racial effects could go under this category as well. I meant "the category of things this situation could apply to". I've changed the phrasing to make things clearer. I can think of many potential ones, but not sure what you have in mind (I also suspect the distinction varies from place to place or time to time). That is the case. However, I don't have a good explanation as to why the effect is larger. There seems to be something else going on here, and I'm not sure what (saw a talk by some expert guy in that field, that boiled down to him not being sure why either). If there are heritable differences between races, mixed-race people should have scores that proportionally track their ancestry. This gives you, among African Americans and Hispanics in general, a correlation between skin color and intelligence, because more European ancestry will mean lighter skin. We can reverse that relationship to suggest that lighter skin color means more European ancestry. Except among siblings--there, which sibling is lighter or darker is random and not related to overall degree of European ancestry. So one can consider a sample of mixed-race people (which almost all non-recent immigrant African Americans in the US are) and compare the within-family and the between-family relationship between skin color and intelligence / social outcomes. What I've seen on this thinks the evidence is inconclusive but favors the heritability theory (that it's the genetic effect, rather than the visual effect, that drives intelligence and outcomes). There seems to be something else going on here, and I'm not sure what (saw a talk by some expert guy in that field, that boiled down to him not being sure why either). People don't capture all of the gains they produce, but those gains do show up somewhere. Similarly with the benefits of catastrophe avoidance. If smarter people get into fewer accidents, that both reduces their insurance premiums (if insurance companies are able to detect and use that info) and everyone else's insurance premiums, because they're less likely to get rammed. Grrrrr.... Ok, I'm definitely shifting to the "the field is complicated and the results are uncertain" meta-position on genetics. Still on the "genes are pretty important" side, but no longer willing to rule out environmental explanations (even shared environment is important, apparently, when comparing between countries). Yes, explanations aren't hard to find. But I would be at least a little bit wary of jumping straight on to "obviously all the economics waffle about externalities and public goods is wrong". Even with those explanations, this means there are other factors influencing country IQ vs country wealth, implying that we can't use that comparison to tell us strong facts about the importance of IQ in outcomes. Grrrrr.... Ok, I'm definitely shifting to the "the field is complicated and the results are uncertain" meta-position on genetics. Obviously racial effects go under this category as well. It covers anything visible. So a high heritability is compatible with genetics being a cause of competence, and/or prejudice against visible genetic characteristics being important ("Our results indicate that we either live in a meritocracy or a hive of prejudice!"). This can be tested by estimating how much IQ screens off race/gender as a success predictor, assuming that IQ tests are not prejudiced and things like the stereotype threat don't exist or are negligible. National average IQ is strongly correlated with national wealth and development indexes, which I think refutes the hypothesis that IQ mainly affects success as a positional quality, or a proxy of thereof, at least at the level of personal interactions. Got any good references on that? Googleing these kind of terms doesn't lead to good links. I know, but the way it does so is bizarre (IQ seems to have a much stronger effect between countries than between individuals). Then I add the fact that IQ is very heritable, and also pretty malleable (flynn effect), and I'm still confused. Now, I'm not going to throw out all I previously believed on heredity and IQ and so on, but the picture just got a lot more complicated. Or "nuanced", if I wanted to use a positive term. Let's go with nuanced. I don't know if anybody already did it, but I guess it can be done by comparing the average IQ of various professions or high-performing and low-performing groups with their racial/gender makeup. I know, but the way it does so is bizarre (IQ seems to have a much stronger effect between countries than between individuals). This is probably just the noise (i.e. things like "blind luck") being averaged out. Then I add the fact that IQ is very heritable, and also pretty malleable (flynn effect), and I'm still confused. Heritability studies tend to be done on people living in the same country, of roughly the same age, which means that population-wide effects like the Flynn effect don't register. Oh, I understand why this is the case. It just means that the outcome of many changes (if they are country-wide) are hard to estimate (and are typically underestimated from twin studies). Why is this bizarre? It simply means that high IQ individuals don't capture all the value they create. Edit: another possibility is that smart people tend to move to places that were doing well. I believe there was a thread in the comments to SSC a while back where it was discovered that the average IQ of American States correlated with a rather naively constructed measure of "favorable geography", e.g., points for being on the coast and for having navigable rivers. Consider that if it had been the opposite - IQ was more a personal benefit than a country benefit - we'd be explaining it as "obviously smart people benefit themselves at the expense of others". Being able to explain something or its opposite isn't explaining, unless we dig deeper. Consider that if it had been the opposite - IQ was more a personal benefit than a country benefit - we'd be explaining it as "obviously smart people benefit themselves at the expense of others". Yes, it's called basing your beliefs on the evidence. No, it's choosing the first plausible rationalisation for the data. People have been suggesting lots of plausible explanations for the effect, and they all sound plausible (and may all the true, to some extent), but we really don't know until we test. So, why were you calling reality "bizarre" again? And assuming IQ captures everything relevant about the difference. If anyone is interested in twin studies or trait heritability, they should look at this site. You might want to distinguish between abilities and outcomes. What's heritable is abilities. The environment determines how these abilities get translated into outcomes. This does get confusing because some abilities are hard to measure directly and because a lot of studies do look at outcomes (which, of course, are easier to observe). But when thinking about such things you should keep the difference in your mind. That's the problem - abilities include "being better at your job" and "seeming to be better at your job", both of which correspond to better individual outcomes, but not both better for outcomes overall. Well, not exactly a problem per se, but it transforms an area with a clear though simplified narrative, into a minefield of special cases. it transforms an area with a clear though simplified narrative, into a minefield of special cases. One issue I have with statements like "~50% of the variation is heritable and ~50% is due to non-shared environment" is that they assume the two kind of factors are unrelated, and you can do an arithmetic average between the two. But very often, the effects are not unrelated, and it works more like a geometric average. In many ways it's more than genetic gives you a potential, an ease to learn/train yourself, but then it depends of your environment if you actually develop that potential or not. Someone with a very high "genetic IQ" but who is underfed and kept isolated and not even taught to read will likely not be a very bright adult, it'll not be "(genes + environment)/2" pour more "(genes * environment)". Other times, it's more like the environment can help compensate for the genes, offsetting a disability, in a way that you end with "min(genes, environment)" rather than average. The truth is that the interaction between genes and environment is much more complicated than a mere pondered arithmetic average, and this is rarely considered extensively when people speak of "how much is it genetic, how is it environmental". Heritability is not a fundamental quantity, and it often does not correspond to what is expected. I found that a useful example for understanding this is consideration of the number of arms that a person has. This seems like it would be 100% heritable. You have two arms because your parents have two arms. This would be true if the group being analysed includes not only people but also other animals such as worms, which have zero arms because their parents have zero arms. However, normally in these discussions only humans are considered and thus genetic differences play no part in how many arms you have. All of the people that don't have two arms are in that situation because of environmental effects. These effects include amputations and birth defects, such as those caused by thalidomide. Thus the heritability of the number of arms that humans have is actually zero. A counter intuitive result of this is that if an ideal world means that everyone is exposed to a uniformly high quality environment, but there is a lot of genetic variation because we don't know how to genetically engineer humans yet, then heritability of beneficial traits such as IQ would be quite high, because the environmental variation would be suppressed. But I am confused about what this means in practice, due to arguments like "contacts are very important for business success, rich people get much more contacts than poor people, yet business success is strongly correlated with genetic parent wealth" and such. Keep in mind that people's genes tend to correlate with their parents' genes. So even if success in wealth is determined by genetics, we would still expect wealth to correlate with your parents' wealth. Yes, but this means that a lot of very rich people are very incorrect as to what is important for their wealth. Which is possible. But you have to posit a lot people being in error about things they should know about, for the heavy-hereditibility picture to fit. Yes, but this means that a lot of very rich people are very incorrect as to what is important for their wealth. They know about the factors they can control. After all, those are the ones they actually focus on.